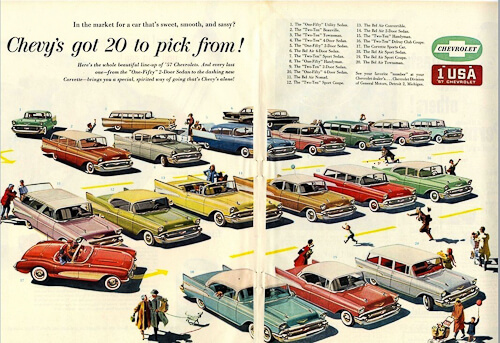 When it comes to studying interior design in the 1950s, the ideas captured in this 1957 Chevy ad certainly are memorable: A rainbow of eye-popping pastels, design that is long and low and angles and flourishes that suggest speed and even, flight. But just like today, there wasn’t just “one” look in the 1950s — there were several. Some looks gained popularity consecutively, as technology, tastes and social mores evolved… while some ran concurrently, recognizing that the U.S. is a diverse, individualistic, creative nation. In this “What’s Your Major? : Retro Renovation” post, I create my own categories out of seven major interior design trends that I have identified from the 1950s. That said, these are big, non-academic buckets. — I’d love to hear your ideas and analysis, too. 1. 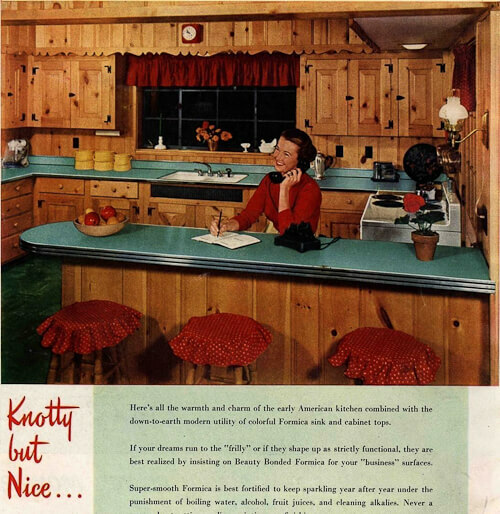 Early American all across the U.S.A.
Everyone loves Eartha Kitsch’s knotty pine kitchen..
20 scenes from 1952 — the end of the 1940s. Where to get vintage colored tile (and more) — all my resources. And, my microsite Save The Pink Bathrooms, of course. The invention and mass merchandising of plastic countertops — like Formica — was a big breakthrough for American homemakers. Plastic surfaces were much easier to install and clean, and this was a big deal in a nation where things like automatic washing machines and dryers were will still not accessible to the masses. Ask any woman from back in the day about “washing day” and watch her cringe — it was arduous, to say the least. Things that could make keeping house easier were a BIG DEAL. Gas and electric stoves… refrigerators… dishwashers… air conditioning… vacuum cleaners… even INDOOR PLUMBING… made their way into the majority of American homes only after World War II. Into this “Technology” bucket, I also will included products, through their styling, that reflected the Atomic Age. We saw lights that looked like flying saucers… cabinet pulls and doorsets that looked like starbursts…. and those boomerangs on the Formica are organic shapes. 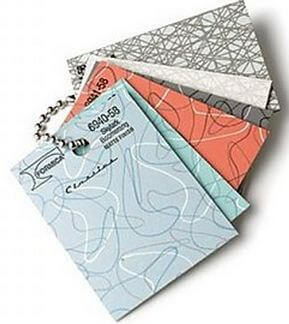 Of course, no one is forced to follow any single design trend religiously. My favorite new interior designer from the postwar era is William Pahlmann, who is recognized for introducing “eclectic” into the world of interior design. For example, he would put European antiques and ancient South American pottery into a room with a long, low modern sofa… he would mix things up. The room above is not his (as far as I know), it is from a 1950s paint advertisement. It’s always been one of my favorites. And interestingly for this story, it includes a bit of most every trend (although no Streamline) that I’ve talked about. Early American: In the painting and paneling. Resilient floor: In the kitchen. Pastels: On the kitchen cabinets and far wall. Full-on Midcentury Modern: In the furnishings. (Although that lovely dining room table adds Shaker-esque cues to the MCM. Me like.) Atomic: In the light fixture. There’s even a European porcelain coffee pot. A timeless room. 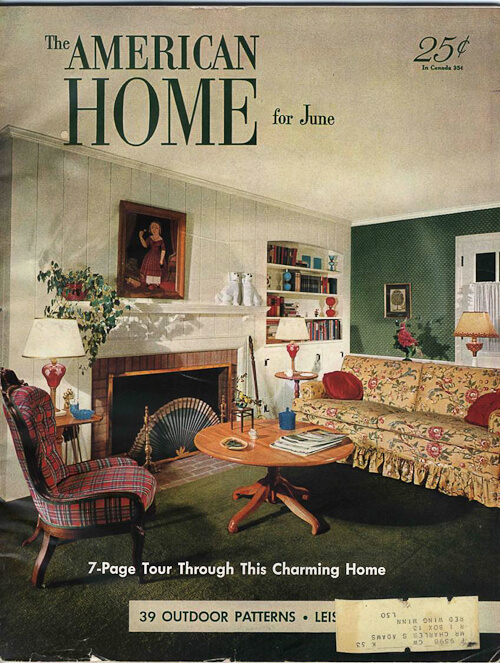 … and this 1954 living room. What do you think, fellow Retro Renovators? Did I capture the biggies? 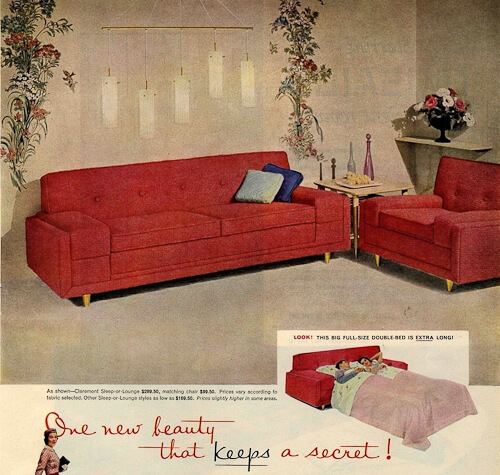 What do you love best about 1950s style? Love these old pictures! It is my in-laws house! They have knotty pine everywhere except the bedrooms! AND they still have the green counter tops and peach tile back splash. We inherited the orange chair in the next picture for our first apartment! It was that bright orange. The pink bathroom reminds me of the pink my Mom painted the outside of the house in the ’60’s. She had extra so she painted the upright piano too. Fun stuff! What a refreshing read! 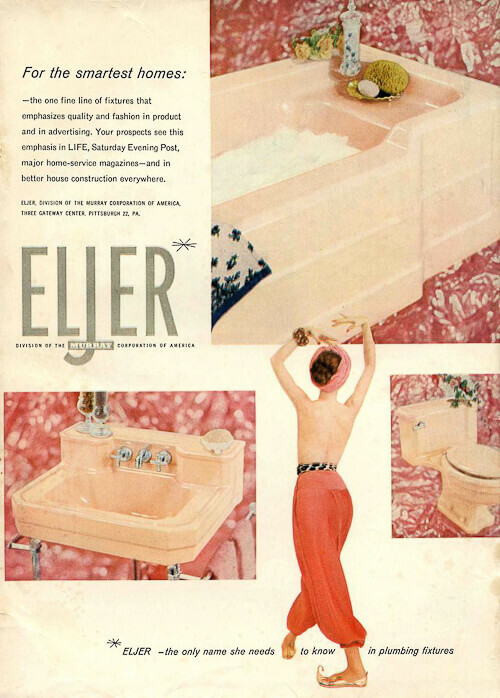 I’d been casually scanning Pinterest for 1950’s interior design ideas for months because we’re getting ready to remodel our kitchen and bathroom and I wanted to bring back some design elements from the home’s original era (built in 1950). 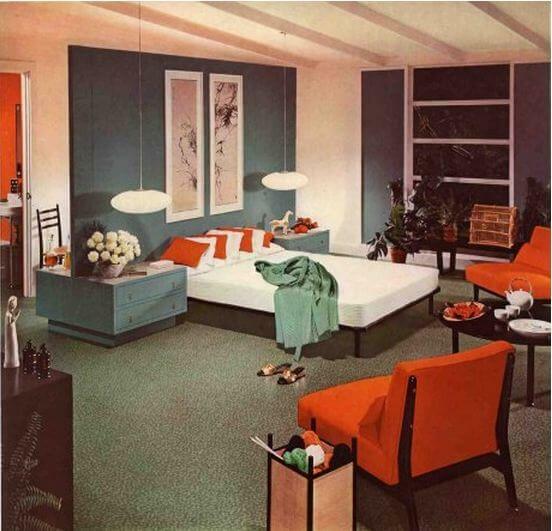 I knew there was more to the 50’s than pastels (which I’m not into… And as a realtor I can vividly imagine the horror in potential buyers’ eyes) and mid-mod (which I love but doesn’t fit with our very traditional house and furniture). This article gave me a whole new perspective on and appreciation for 50’s design. Thank you for your very thorough analysis!! I also think, though there must have been some hostility to it in some respects, there also was a certain uptick in the use of Asian decor items picked up by soldiers returning from WWII and Korea? At least that’s what I remember from my grandparents’ home chiefly. Also it seems to me that Asian items from that era have a little different look and ‘feel’ to them than just classical Asian. Every generation that reinterprets a style puts their own twist on it in some way even when they see themselves as being historically correct. I have quite a bit of mid century furniture, appliances and a complete set of Astro Franciscan Ware with 12 place settings. I know that there are people who would love to have this but am at a loss how to connect with them. Please advise. Ps: All items are in pristine condition and I will provide pictures if you’d like. Peg, you can sell these on ebay, etsy or craigslist. If any of the pieces are of particularly high value, you may want to have them appraised / work with a knowledgeable local company to help you get the best price. Good luck. I will be moving into a house from the 1950″ and I want to know what is the metal piece with the design pattern, the piece that holds up the upper roof over the front door. I think more aluminum. They are place on both ends of my porch, the color is white. Can you please email with an answer. Note, with so many readers I am not able to email responses — you need to follow this thread. Stunning, spectacular 1961 mid-century modern time capsule house in Minnesota — 66 photos!